About a week ago, on the eve of a quick trip to South by Southwest that I was going to be attending with New Balance, I received a delivery of the brand’s latest sneaker release—a recently reissued “new and improved” version of its 574’s in gray. I couldn’t recall having put on a pair of New Balance sneakers since my elementary school days (not for any particular reason), so before slipping into my new ones, I was not only curious but skeptical of whether the shoes would earn a spot in my less-than-large NYC closet. After all, with every major fashion brand on the comfortable footwear bandwagon these days, along with a slew of other well-established athletic brands to compete with, how would these shoes compare? Well, I spent the next 48 hours finding out. The first thing I noticed upon trying on the shoes, pre–mirror check, was how comfortable they were. 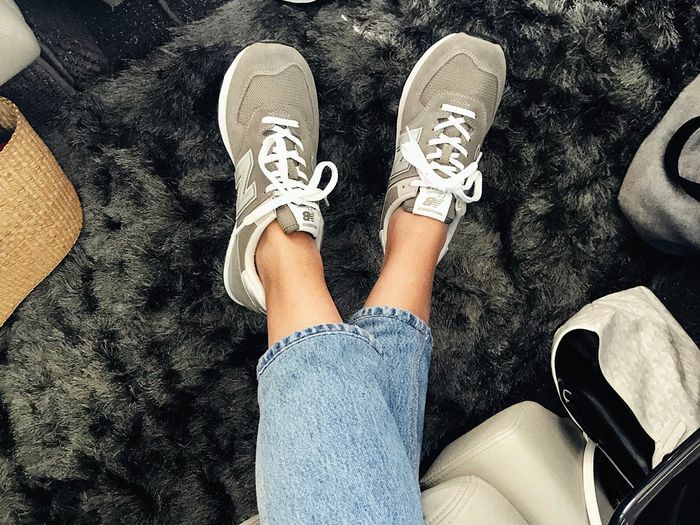 Not just sneaker comfortable but wear-for-an-entire-weekend comfortable. This meant barrier one was passed. Next, having slipped on my go-to jeans of the moment, a pair of cropped high rise Re/Dones, I threw on a tee to see how they looked actually with a full outfit. The skinny mirror in my bedroom alluded to great, but what about the more accurate one outside the door? This was the moment of truth. Was I about to spend two days in Austin (with a bunch of strangers, nonetheless) hating how I looked? Fortunately, I did not, because thanks to the 574’s neutral color, sleek design, and form-fitting shape, the shoes were not just flattering, but they actually lent themselves quite well to looking “put together.” Barrier two was passed. And now that I’ve returned from Austin with my feet feeling great (the comfort factor never faded) and having achieved multiple Instagram-worthy outfits in the shoes, I can tell you that not only were all my closet barriers to entry passed, but that the shoes are indeed worth the purchase, no matter how much space you’re working with. Consider them the perfect option for when you want your outfit to be comfortable and look cool but not like you’re trying too hard. The perfect example can be seen through blogger Caroline Daur, who models them much better than me. See how she styled them below, then continue to shop the shoes. The aforementioned trip was paid for by New Balance. Editors' opinions are their own.